Heart Attack – Aspirin can save lives! 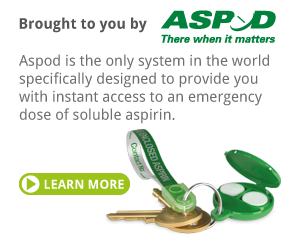 It is now even more important than ever that YOU carry an Aspod containing ‘immediate’ aspirin! Mail Online, Friday 14th July, 2017. October 2016: Dr Mark Porter met Peter Rothwell, Professor of Clinical Neurology at the University of Oxford, to discuss his important new findings relating to mini-strokes (TIA), strokes, heart attack and aspirin. Doctors could spot twice as many heart attacks in women by using a newer, more sensitive blood test, a study claims. The test looks for minute traces of a protein that signals that the heart muscle may have been damaged. Standard tests still used by much of the NHS only detect higher levels of this protein, called troponin. Research from the Royal Infirmary of Edinburgh shows the standard test misses many cases of heart attack in women with symptoms like chest pain. 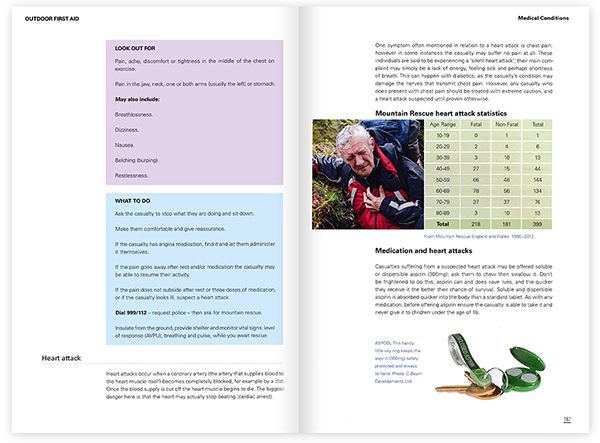 The book is packed with good advice for administering first aid in remote settings and is essential reading for those outdoor enthusiasts. Click the image to view a full size pdf. 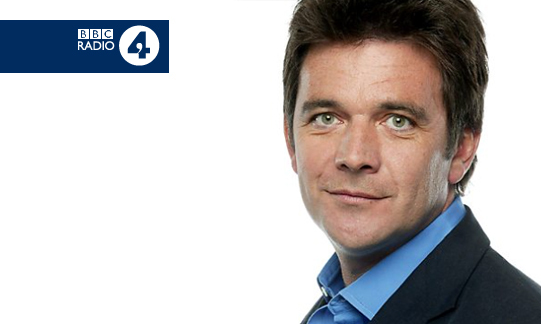 Aspod was once again recommended by Dr Chris Steele on ITV’s ‘This Morning’ programme. It is now the fourth time that Aspod has been featured. This short video by thefirstaidshow.com explains the benefits of taking emergency aspirin and features the Aspod – a device for carrying your aspirin with you at all times. Aspod inventor has written to health chiefs about the high level of heart disease and the proven benefits of carrying immediate aspirin. 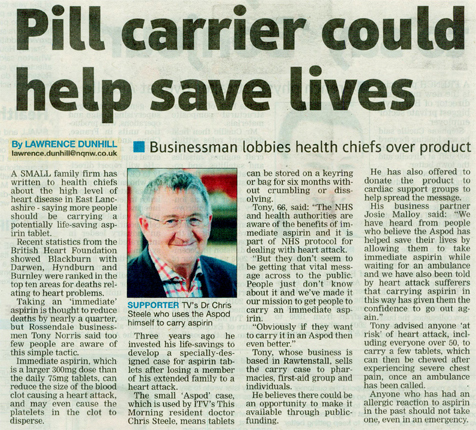 Aspod inventor Tony Norris has written to health chiefs about the high level of heart disease and the benefits of carrying immediate aspirin. Research shows ‘Heart in the mouth’ moments during a big football match may literally put fans’ lives at risk. Be prepared before the games; ensure you know what to do if the worst happens and keep an Aspod with you at all times. Researchers studied the effects on German fans of watching their home team compete in the 2006 World Cup finals. For men the risk of having a heart attack or another cardiovascular problem was three times higher on days when the German team was in action. Beetroot juice and blood pressure – really! UK research suggests that drinking 500ml of beetroot juice can significantly reduce blood pressure. An interesting new report from Barts, the London School of Medicine and the Peninsula Medical School, found that in healthy volunteers blood pressure was reduced within an hour of drinking 500ml of beetroot juice! ASPOD helped save my life! A letter from a reader who benefited from having aspirin close to hand during a heart attack. When I recently had a mild heart attack I chewed a 300mg aspirin from my ASPOD and feel sure that together with the GTN spray I had helped to relieve symptoms gradually as I waited for the ambulance. I informed the ambulance and medical staff at the hospital and they nodded approval but were busy making me comfortable, but it was one less thing they needed to give me. I’ve also told quite a few of my family and friends particularly my son who is an ambulance driver, and all were really impressed by your product. I will certainly keep my ASPOD by me at all times and continue to tell anyone I know about the importance of having the ASPOD to hand. A dose of ‘Immediate’ Aspirin in the event of a heart attack could save your life! This site brings you the medical evidence, the personal stories and useful information regarding heart attacks. October 2016: Dr Mark Porter met Peter Rothwell, Professor of Clinical Neurology at the University of Oxford, to discuss his important new findings relating to mini-strokes (TIA), strokes, heart attack and aspirin. Your browser does not support the audio element. © 2019 Heart Attack – Aspirin can save lives!. All Rights Reserved.